Last makes of 2013 and final tally! So this will be the last post of 2013. I am not going to enter into the hit/misses of the year as I was so distracted by uni and court cases nothing seemed to be the right size. I am promising myself a course in fitting and I hope it comes off early in 2014, but first I need to win lotto or get a job to pay for it! This is Burda 4/2012 110A. The fabric is silk that someone put on the 'take' table at one (of only 2)Guild meetings I managed to go to. I loved it immediately. It is crisp and swishy and feels lovely on. Those of you who are a bit observant will note that this is a dress - but that Burda 4/2012 110A is not. It is a pants suit. This was a pants suit when I made it 12 months ago. I made it just in time to go to a friend's 40th birthday celebration in the park on a beautiful sunny Brisbane summer afternoon - sounds perfect, right? It was until my son said "Mum, you look like a clown!" I took it off and put something else on. and the pockets it had (no more) added bulk to this. Here is my Dad wearing his new Urban Don flat cap that I made for his 80th birthday. (If you don't know Urban Don go have a look as he makes such interesting clothing, hats and jewellery. The photography on his website is really amazing also.) No one even picked that I made it - not until I blew my own trumpet and told them! Dad loves it and even though he knows it isn't polite to wear a hat at the table, he wouldn't take it off! I guess that's a prerogative it you reach 80! I forgot to take photos when I finished it up yesterday - doh so unfortunately I don't have any showing the inside - there's another blog post in that when I get some photos in the next few days. I will say it was VERY easy to put it together - I lined mine also and it fits him perfectly. He's very happy with it and I'm happy he's happy. If you haven't made a cap before I highly recommend Urban Don's patterns. Again big thanks to Urban Don. On hold - Urban Don Cap Done! The strawberry dress is hold for a few days. It's my Dad's 80th birthday today and we are going out for a family lunch on Sunday. My Dad has always worn hats and caps and when Urban Don released a cap pattern a few days ago, I knew I had my gift. (Also one of my cousin's child is coming to Brisbane for a working holiday on Sunday morning also so I'll be busy with him for a little bit). Edit: The cap is done but I will post when I get a photo of my Dad wearing it tomorrow. It looks great! The cap pattern is so easy, but I did mange to sew the cap pieces together incorrectly and only worked it out after I had sewn the lining together and had the cap and the lining topstitched (doh!). I just thought it was going to magically become a cap but unpicked it last night. I have most of it together but need some Petersham for the inside band. I bought some 1" bias tape but I think I'll get the Petersham tomorrow in my running around. I'm making Simplicity 8372. Instead of a shirt though, I'm making it into a shirt dress. I took the skirt pattern and put it on the top section and then cut it out. Made a boo boo though as I have cut the front skirt about 2 cm shorter. I don't need it shorter but will piece a big band on the bottom to make it longer and only you and I will know it was a mistake! Then I straightened it at the waist area to get a smooth edge. I decided that just cutting it longer wouldn't accommodate my hips so I made it a little A line. This is more stash fabric. This is a left over from when I was making kindergarten sheets. It was bought at Spotlight about 4 years ago and it's just a cotton. Edit: Just wanted to add - all stash fabrics! 1. First up isn't really a true UFO but it needed to be done! This is the t-shirt that the owner of York Street Mechanic's in Auckland gave my son - he loves it but as a 9 y.o boy he is like "YUK!" at the boobies. So I made a slight modification below. I realise just now that's the photo with the pin in it, but all I did was zig zag around the bikini top and one boy happy again! Cancelled - due to lack of interest. I am cancelling the Brisbane Blogger's meet up. I have only had two takers and we think we'll try again next year some time. Thanks to Rosi and Bianca for their support however. 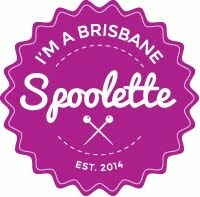 For a long time I have wanted to organise a Brisbane Blogger's meet up and finally the time has come! I'm sorry there isn't much notice - combination of busy life, sickness and pre-booked holidays. I made some pyjamas. I'd like to make (finish) some other more interesting things but I need new pj's. I used stash materials because I have too much. You'll recognise the aqua fabric from the last wearable muslin I made of the ImageWear top. I used that for the top and I used 2 1 metre remnant peices of cotton which is very soft and a perfect colour match. I made some bias from the spot fabric and I put some fuchsia ric rac on the hem. If I had thought of it before I would have put it under the bias on the top front but I didn't.The pink top is a remnant piece of broderie anglaise from years ago also and the black and white gingham was a left over piece from a friend who sews. This it the Imagewear top pattern I made. It looks like a wide neckline on the pattern and it is. This is my iteration of the top. It is a little wide and I need to adjust the shoulders slightly and take out a wedge - about 2 cm at the neckline to nothing at the sleeve head. You can just see that the neckline is also a little wobbly with the bias edging. I think I stretched it out when I was doing it but that should fix up when I fix the shoulders. I really only made this up as a wearable muslin... they put in elastic in the waist and the sleeves - I didn't want it pouffy around my waist (I have natural pouff) and I cut the sleeves short. They look tight but they aren't. I love the fabric... just an end of roll from Spotlight last year. I also love it with my white jeans ($3 at Kmart one day and the fabric is very nice - score). Sorry about the stupid look, odd angle and sloppy hair but the camera kept saying the battery was out and shut down. I was over it by this time. My son loves Adventure time cartoon and asked if he could buy a hat from one of those games shops. He knew already it was $16 and of course I said "No, but I'll make you one." At which he replied "you always say that Mum but you never get to it." Hmmm. We found a pattern here, and I downloaded it and taped it together. It is made for A2 paper size but I fumbled around and got it onto 4 A4 sheets. Then we bought one metre of white felt (or you can use fleece but felt was closer to home so felt it was). Alex helped me cut out the pattern and the felt and then I sewed it up - took about 30 minutes and it is self faced too. Easy. Great hat for winter but with 28 degrees here he said "thanks, I love it but it's too hot!" Of course I knew that but he'll have some school cred. New Zealand... and busy, busy life! We have had a busy, busy life the last few weeks. Immediately after finishing painting and cleaning, my German friends came from Köln (Cologne) for a week with us. We did lots of great things and they are so charming that they just love my house and love to stay in and we cook and eat and drink lots of wine and talk a lot! While we are in NZ, they are driving Brisbane to Sydney, through the Hunter Valley. They LOVE Sydney (who doesn't) and over the more than 20 years we have know each other, have been many, many times. When I am more flush (with money) we usually go to Germany or they come here, but I haven't seen them since 2009 when we met up in Cyprus. It is always like we have seen each other the last week. We saw some ostriches while driving and stopped. They are huge and were very animated puffing up their wings and flapping them to scare us away no doubt. Food is playing a big part in our holiday! Riding in the Redwoods on rented bikes.